The most obvious spot in Melbourne, and I haven’t covered it off in any detail! Full of interesting people and there is not a lot of over officious Metro employees policing photographers – just be a little discreet, maybe take a compact or at least only point the camera occasionally? Start with the platforms and then explore the whole place, bit by bit. There is an old subway connecting all the platforms – you can find the entrance in the middle of most of the platforms. Go down and have a look – keeping in mind how travelling down the stairs gives you opportunities for interesting perspectives both high and low. The subway also connects to the Degraves Street Subway running under Flinders Street itself. You can read about it here. Again, some fantastic aesthetics – keep an eye out for the massive advertising walls that provide an interesting background fairly easily. Watch for late afternoon and early morning light breaking through the gaps in the roof for some pretty special results here. The walls are pretty much as they were at least 50 years ago, complete with the “Do not spit” signs. Just make sure you take the time to explore the whole station. There are so many little things to discover. 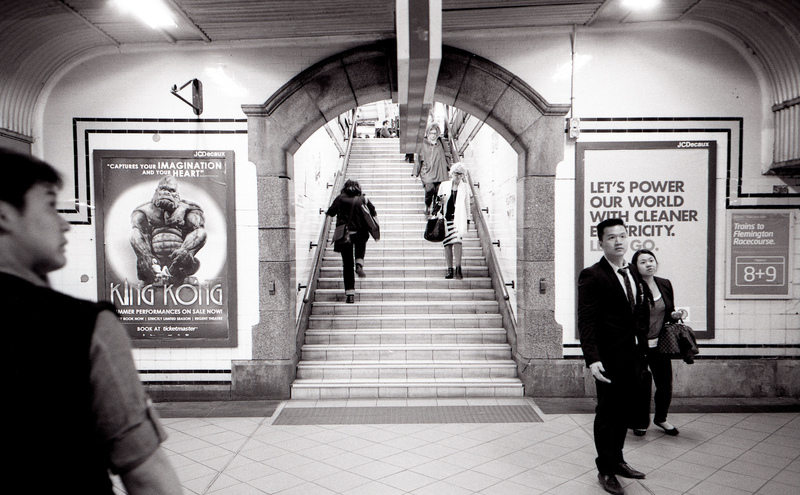 Start here, then move on to the Degraves St Subway for a few hours of sublime street photography! Did you get hasseled by staff for taking g shots or did you get permit ?? Never worried too much about a permit – if you are on the street, I am not sure there is any law specifically covering Flinders St like the War Memorial. I have been asked once to not take photos by a staff member, but just say “sure” and “sorry” and keep moving… Keep moving and no one can be bothered to worry – and only put the camera up to your eye when you have a shot, take one, and then move on. If you miss the shot, keep moving. Nobody will bother you generally speaking. I think if you camp out for a while in one spot, you might get asked? There are very few “no camera” signs at flinders st compared to Melbourne central, for example – I think they just accept that most people are tourists? Anyway, I am not sure what the “no camera” law achieves in these days of awesome phone cameras?